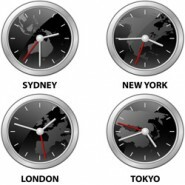 If managing meetings taking place simultaneously in multiple locations is a challenge, it is exponentially more challenging when those locations are in different time zones – it is until you use CABS to manage these events. It doesn’t matter whether your overseas locations are actively managed using CABS – i.e. the remote location has access to CABS and uses it to manage all bookings and events – or not. Every location within CABS has its own time-zone and CABS seamlessly handles the relationship between each location, even taking account of changes due to daylight saving time. This is especially helpful when booking video-conferences. When used in conjunction with the CABS automatic email feature, the notes against each and any aspect of a booking and the ability to automatically add resources based on meeting type (i.e. video conference) – whole booking notification and international liaison requirement happens in the background without the need for any other intervention. In short it’s as easy as pie!